The swirling motion of floating bells provides this Chiming Bell fountain's peaceful meditative sounds. Create an oasis in your garden with the soothing murmur of the water combined with the gentle ringing of the bells to create a tranquil mood. The flamed-finished copper bowl is a beautiful focal point and solid brass bells offer a superior sound. 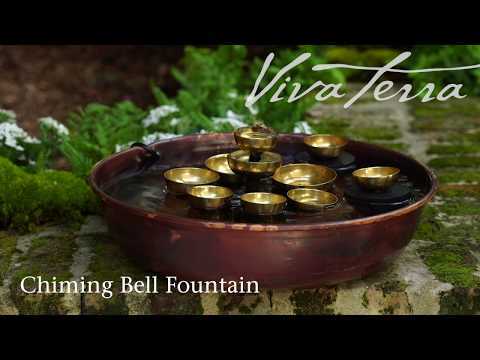 Water bubbles up through a central cluster of brass bells, while the two floating bells gently swirl around the others, creating a relaxing sound environment.